9789287040541 | World Trade Organization, August 23, 2016, cover price $60.00 | About this edition: Trade Policy Reviews analyze the trade policies and practices of every member of the World Trade Organization. 9789287040503 | World Trade Organization, July 26, 2016, cover price $60.00 | About this edition: Trade Policy Reviews analyze the trade policies and practices of every member of the World Trade Organization. 9789287040510 | World Trade Organization, July 26, 2016, cover price $60.00 | About this edition: Trade Policy Reviews analyze the trade policies and practices of every member of the World Trade Organization. 9789287040527 | World Trade Organization, July 26, 2016, cover price $60.00 | About this edition: Trade Policy Reviews analyze the trade policies and practices of every member of the World Trade Organization. 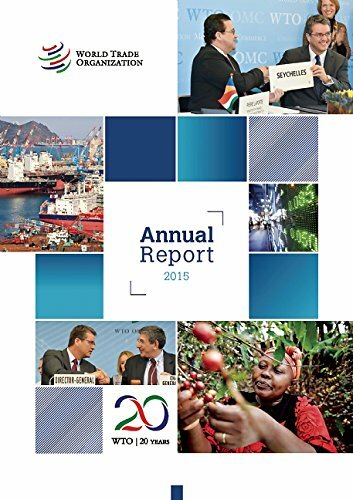 Product Description: The Annual Report 2016 provides an overview of WTO activities in 2015 and early 2016. The Report begins with a message from WTO Director-General Roberto AzevÃªdo, followed by a brief overview of 2014-15 and more in-depth accounts of WTO activities over the past year. 9789287040671 | World Trade Organization, July 5, 2016, cover price $50.00 | About this edition: The Annual Report 2016 provides an overview of WTO activities in 2015 and early 2016. 9789287040480 | World Trade Organization, June 28, 2016, cover price $60.00 | About this edition: Trade Policy Reviews analyze the trade policies and practices of every member of the World Trade Organization. 9789287040497 | World Trade Organization, June 28, 2016, cover price $60.00 | About this edition: Trade Policy Reviews analyze the trade policies and practices of every member of the World Trade Organization. 9781107149076 | Cambridge Univ Pr, May 27, 2016, cover price $225.00 | About this edition: The Dispute Settlement Reports of the World Trade Organization (WTO) include Panel and Appellate Body reports, as well as arbitration awards, in disputes concerning the rights and obligations of WTO members under the provisions of the Marrakesh Agreement Establishing the World Trade Organization. 9789287040442 | World Trade Organization, May 24, 2016, cover price $60.00 | About this edition: Trade Policy Reviews analyze the trade policies and practices of every member of the World Trade Organization. 9789287040473 | World Trade Organization, May 24, 2016, cover price $60.00 | About this edition: Trade Policy Reviews analyze the trade policies and practices of every member of the World Trade Organization. 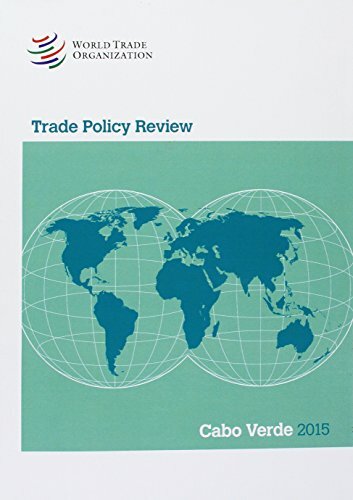 9789287040466 | World Trade Organization, May 24, 2016, cover price $60.00 | About this edition: Trade Policy Reviews analyze the trade policies and practices of every member of the World Trade Organization. 9789287040404, titled "Examen Des Politiques Commerciales 2015: Union EuropÃ©enne" | World Trade Organization, May 24, 2016, cover price $60.00 | About this edition: Trade Policy Reviews analyze the trade policies and practices of every member of the World Trade Organization. 9789287040367 | World Trade Organization, May 24, 2016, cover price $60.00 | About this edition: Trade Policy Reviews analyze the trade policies and practices of every member of the World Trade Organization. 9789287040428 | World Trade Organization, May 10, 2016, cover price $60.00 | About this edition: Trade Policy Reviews analyze the trade policies and practices of every member of the World Trade Organization. 9789287040411, titled "Examen de las PolÃ­ticas Comerciales 2015/ Trade Policy Review 2016: UniÃ³n European/ European Union" | World Trade Organization, May 24, 2016, cover price $60.00 | About this edition: Trade Policy Reviews analyze the trade policies and practices of every member of the World Trade Organization. 9781107139206, titled "Dispute Settlement Reports 2014: Pages 1125â1724" | Cambridge Univ Pr, March 23, 2016, cover price $250.00 | About this edition: The Dispute Settlement Reports of the World Trade Organization (WTO) include Panel and Appellate Body reports, as well as arbitration awards, in disputes concerning the rights and obligations of WTO Members under the provisions of the Marrakesh Agreement Establishing the World Trade Organization. 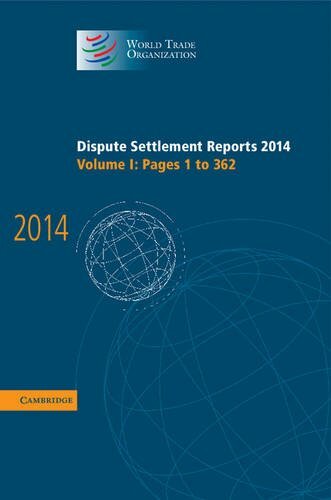 9781107139237 | Cambridge Univ Pr, March 23, 2016, cover price $250.00 | About this edition: The Dispute Settlement Reports of the World Trade Organization (WTO) include Panel and Appellate Body reports, as well as arbitration awards, in disputes concerning the rights and obligations of WTO members under the provisions of the Marrakesh Agreement Establishing the World Trade Organization. 9781107139190, titled "Dispute Settlement Reports 2014: Pages 1725â2186" | Cambridge Univ Pr, March 23, 2016, cover price $225.00 | About this edition: The Dispute Settlement Reports of the World Trade Organization (WTO) include Panel and Appellate Body reports, as well as arbitration awards, in disputes concerning the rights and obligations of WTO members under the provisions of the Marrakesh Agreement Establishing the World Trade Organization. 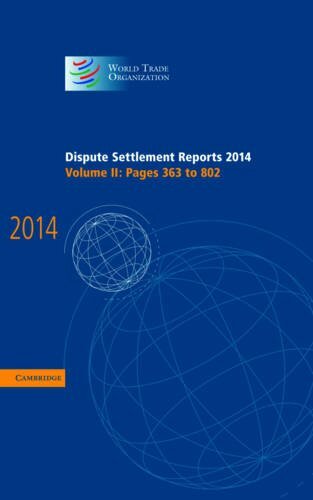 9781107139213, titled "Dispute Settlement Reports 2014: Pages 803â1124" | Cambridge Univ Pr, March 23, 2016, cover price $250.00 | About this edition: The Dispute Settlement Reports of the World Trade Organization (WTO) include Panel and Appellate Body reports, as well as arbitration awards, in disputes concerning the rights and obligations of WTO members under the provisions of the Marrakesh Agreement Establishing the World Trade Organization. 9781107139220, titled "Dispute Settlement Reports 2014: Pages 363â802" | Cambridge Univ Pr, March 23, 2016, cover price $250.00 | About this edition: The Dispute Settlement Reports of the World Trade Organization (WTO) include Panel and Appellate Body reports, as well as arbitration awards, in disputes concerning the rights and obligations of WTO Members under the provisions of the Marrakesh Agreement Establishing the World Trade Organization. 9781107149069, titled "Dispute Settlement Reports 2014: Pages 2187â2652" | Cambridge Univ Pr, March 23, 2016, cover price $250.00 | About this edition: The Dispute Settlement Reports of the World Trade Organization (WTO) include Panel and Appellate Body reports, as well as arbitration awards, in disputes concerning the rights and obligations of WTO members under the provisions of the Marrakesh Agreement Establishing the World Trade Organization. 9789287040350 | World Trade Organization, May 24, 2016, cover price $60.00 | About this edition: Trade Policy Reviews analyze the trade policies and practices of every member of the World Trade Organization. 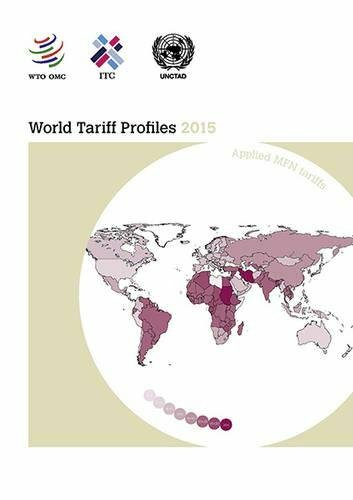 9789287039941 | World Trade Organization, March 29, 2016, cover price $50.00 | About this edition: World Tariff Profiles 2015 provides a unique collection of data on tariffs imposed by WTO members and other countries. 9789287040459, titled "Examen de las PolÃ­ticas Comerciales 2015/ Trade Policy Review 2017: RepÃºblica Dominicana/ Dominican Republic" | World Trade Organization, May 24, 2016, cover price $60.00 | About this edition: Trade Policy Reviews analyze the trade policies and practices of every member of the World Trade Organization. 9789287040398 | World Trade Organization, May 24, 2016, cover price $60.00 | About this edition: Trade Policy Reviews analyze the trade policies and practices of every member of the World Trade Organization.